For you or your partner, go ahead and say Bye, Bye Stinky Feet! 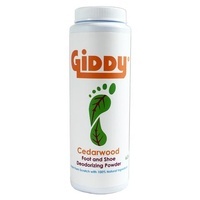 GIDDY Peppermint all natural foot and shoe deodorizer spray comes in a 4 ounce bottle and fights odor, freshens feet, shoes and sneakers - bonus: it even works well on Yoga mats. This is a great product for climbers, barefoot minimalist (you know who you are), cyclists, hikers or anybody that has a case of stinky feet and needs a little relief! 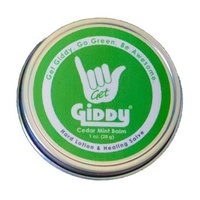 Product is small batch manufactured in the USA using all natural ingredients. Witch Hazel Extract: Witch Hazel extract is a wonderful ingredient for use in cosmetic and medicinal preparations. It is gentle enough to be used alone, or it may be combined with other ingredients or herbs. Our witch hazel extract has been double distilled, and contains 86% witch hazel extract and only 14% alcohol. This makes it more soothing than versions found in your local store, and lacks the alcohol sting and scent. Witch Hazel extract is distilled from the twigs and bark of the Witch Hazel tree (Hamamelis virginiana). Menthol* - our 100% organic and natural menthol is derived from the cornmint plant. While menthol gets a bad rap from it’s use in cigarettes, EWG’s skin deep database rates menthol as a low hazard ingredient in all categories. It is a testament to menthol’s safety and soothing properties that this natural byproduct is used in everything from toothpaste to medicated oils and throat drops. It’s even used in candy for children! In the same way that hot peppers trigger your body’s heat receptors without actually inducing a chemical heat change, menthol tricks your body’s cold receptors. This reaction in turn activates a cooling sensation which helps to promote numbing of minor aches and pains. Ravensara Essential Oil: Attributes to its product include analgesic, anti-allergenic, antibacterial, antimicrobial, antidepressant, antifungal, antiseptic, antispasmodic, antiviral, aphrodisiac, disinfectant, relaxant and tonic substance. Thyme Essential Oil: Attributes include antibacterial, antispasmodic, antirheumatic, expectorant, hypertensive, and calming properties.